Complete Feltmaking: Easy Techniques and 25 Great Projects by St. Martin's Griffin at Book Sellers Union. Hurry! Limited time offer. Offer valid only while supplies last. Felt is an ancient craft, dating back to the Bronze Age. It is the oldest textile fabric and was made before people learned to spin, weave or knit. Felt is an ancient craft, dating back to the Bronze Age. It is the oldest textile fabric and was made before people learned to spin, weave or knit. Hand-made felt has an entirely different quality to the machine-made felt found in craft stores. It is a chunky, more hardwearing and can be made in a variety of designs and colors- it does not fray, so no sewing is required. And any crafter can learn the art of creating felt with a little fleece, water and soap. 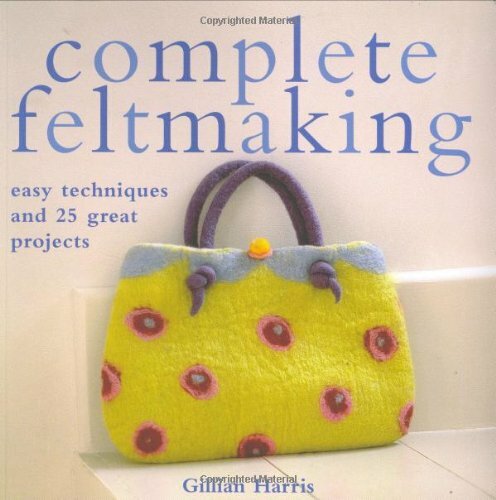 This exciting new book covers all aspects of feltmaking, from making simple flat felt to felting 3-d shapes, as well as felting knitted work, needle felting and some more advanced techniques. Each technique is carefully explained in detail with step-by-step instructions and photographs. The several projects accompanying each technique also have full instructions and step-by-step photography. From a cheerful polka-dot bag and cozy felted slippers to a whimsical fish mobile and cozy heart shaped rug , this valuable primer offers a wide range of projects making it an ideal book for crafters of all skill levels seeking to add fashionable felted projects to their wardrobe and home.